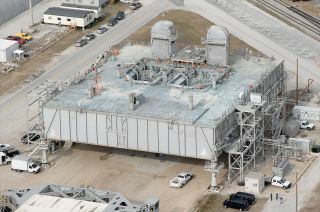 An aerial view of a mobile launch platform (MLP) as seen parked at NASA's Kennedy Space Center in Florida. The three massive metal stands from which NASA's towering rockets launched to the moon and its space shuttles blasted off for Earth orbit are in danger of being sold as scrap metal if new users cannot be found for the historic mobile launch platforms. "A Request for Information released [Aug. 16] will gauge the interest of commercial or government entities for using three nearly identical mobile launch platforms in support of either commercial launch activity; deconstruction; or an alternative option that benefits the public, environment or other entities," NASA said in a statement. The platforms then remained with the rocket on the launch pad, serving as the pedestal from which the boosters lifted off for the moon. With the introduction of the space shuttle in the 1980s, the mobile launch platforms (MLP) were converted to support the winged orbiters. For three decades, the MLPs moved the shuttles between the Vehicle Assembly Building and Launch Pads 39A and 39B, as well as served as the base from where the orbiters soared spaceward. When the shuttle program came to its end in 2011, so did NASA's need for the three mobile launch platforms. A new platform, built in 2010, is being readied to support NASA's next heavy-lift rocket, the Space Launch System (SLS). The same crawler-transporters that moved the previous MLPs are also being modified to support the new platform. Budget constraints have left NASA without the money to maintain the no-longer-needed MLPs, leading to the space agency seeking new users for the platforms. The Request for Information (RFI) seeks ideas for three possible fates for the mobile launchers, including their being reused by companies now developing commercial rockets. NASA recently sought similar ideas for the commercial use of one of its two historic Apollo and shuttle launch pads, Pad 39A, with two companies submitting proposals now under consideration. NASA is also open to "alternative options" for one or more of the mobile launch platforms. These ideas might include converting a platform into a museum exhibit, an artificial reef or even an oil rig. Organizations proposing such uses are asked in the RFI to detail plans for the "disassembly, transportation, or preservation" of the platform(s). If reuse or repurposing are not options, then NASA is also requesting suggestions for the deconstruction of the MLPs for their disposal and recycling. A similar agreement was reached in 2009 to clear Launch Pad 39B of its fixed and rotating service structures, the gantries used in the launch of 53 space shuttle missions. Proposals to modify or dispose of the mobile platforms will require an additional review given the MLPs eligibility to be added to the National Register of Historic Places for their service to the space shuttle program. The deadline for responses to the Request for Information is Sept. 6. The mobile launch platform RFI is the latest in NASA's work to transform the Kennedy Space Center into a multi-user spaceport for both government and commercial customers and support the agency's future spaceflight programs and initiatives. These include plans to work with companies to send crews to the International Space Station in the next four years and launch astronauts to study an asteroid by 2025.